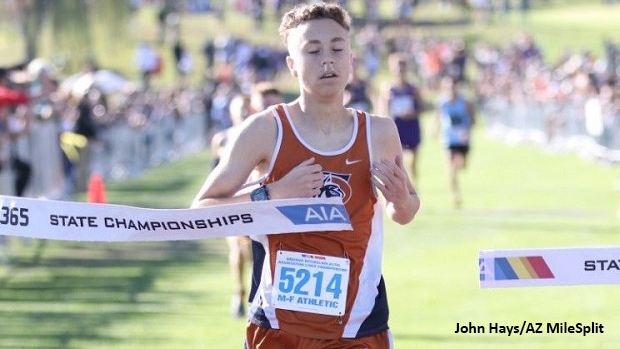 The Division 2 races made up the second half of the morning races in between Division 4 at the AIA State Championships on Saturday morning. Flagstaff had brought their A-Game with both the boys and girls teams eyeing a repeat State Title. Alex Rafferty (Millennium, So.) quickly took hold of the lead with Braedon Palmer (Sunrise Mountain, Jr.) and Connor Heron (Desert Mountain, Jr.) on his shoulder. Despite being a conditioned runner since he was in elementary school, the 2018 cross-country season was Rafferty's first for Millennium High School, and after taking the victory in his section at Cesar Chavez, Rafferty was eager to test his mettle over the rolling hills of Cave Creek. Palmer took control over the next mile but the race was still tight with Rafferty and Heron in the mix. Shortly afterwards, the 2017 third-place finisher Ayden Schilb (Cienega, So.) caught four guys in front of him to challenge Rafferty for the lead. Schilb had finished 3rd in the D2 race at State last year and was not about to let the lead slip away from him. Though Palmer would challenge Schilb through the next mile, Schilb would hold off Palmer and press his way all the way to the finish in 16:07, having left everything on the course. Palmer took runner-up and Kyle Partin (Marana, Sr.) finished a close third place. Heron finished 4th in 16:15, followed by Rafferty, and Randy Espinoza (Deer Valley, So. ), each just a second apart. From a team stand-point, Flagstaff know how to run in a crowd and things were no different on Saturday. Max Davis (So.) and Riley Human (Jr.) led the charge with Nate Milton (Sr.) less than 20 seconds behind. Though, Casteel had briefly held the lead the Flagstaff Eagles rallied over the third mile and picked up 20 spots. Zac Joyce (Jr.) clocked in at 17:14 to finish 37th and Gabrial Harju (Jr.) picked up 13 places over the final mile alone, putting Flagstaff ahead of Casteel with 128 points.